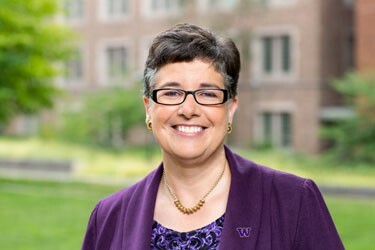 As the president of one of the world’s great public universities, Ana Mari Cauce is leading the University of Washington in advancing its mission in four key areas: providing a leading-edge student experience, conducting research and scholarship that has a global impact, upholding the UW’s dedication to its public mission and infusing the entire university with a commitment to innovation. A member of the UW faculty since 1986, Cauce became interim president in March 2015, having previously served as provost and executive vice president, and the UW Board of Regents selected her to become the UW’s 33rd president at a special meeting Oct. 13, 2015. Throughout her career, Cauce has championed access to higher education, including through the Husky Promise, which provides full tuition to eligible Washington students who otherwise could not attend college. As part of her strong belief in ensuring access to higher education for all, just one month into her role as interim president she engaged students in an honest discussion about race and equity, launching an effort to create a more just and diverse community. The UW also views innovation as an imperative, and as part of that in June 2015 Cauce announced the launch of the Global Innovation Exchange. A partnership between the UW and Tsinghua University, with foundational support from Microsoft, GIX will educate the next generation of innovators through a project-based, globally focused curriculum available nowhere else. Raised in Miami after emigrating with her family from Cuba, Cauce earned a B.A. in English and psychology from the University of Miami and a Ph.D. in psychology, with a concentration in child clinical and community psychology, from Yale University. During the course of her career at the UW, Cauce has been appointed to various leadership positions, including director of the UW Honors Program, chair of American Ethnic Studies, chair of Psychology, executive vice provost and dean of the College of Arts and Sciences. In 2011 Cauce was named provost and executive vice president, responsible for overseeing the education, research and service missions of the university’s schools, colleges and other academic units. For her teaching, scholarship and advocacy, Cauce has received numerous awards, including the Dalmas Taylor Distinguished Contribution Award, the Luis Fernando Esteban Public Service Award, the James M. Jones Lifetime Achievement Award of the American Psychological Association, the Grace Hopper Exemplary Leadership Award and the Distinguished Contribution Award from the Society for Community Research and Action. In 1999 she was awarded the Distinguished Teaching Award, the highest honor the University of Washington gives to faculty members for their work with students in and outside the classroom. Cauce is a professor of Psychology and American Ethnic Studies, with secondary appointments in the Department of Gender, Women and Sexuality Studies and the College of Education. She maintains an active research program, focusing on adolescent development, with a special emphasis on at-risk youth. She is also a strong advocate for women and underrepresented minorities to pursue careers in science, technology, engineering and mathematics. Cauce remains active in the classroom and continues to teach and mentor undergraduate and graduate students. La profesora Ana Mari Cauce es la Rectora de la Universidad de Washington, donde ha sido académica de carrera por más de dos décadas en las áreas de psicología, estudios de género y estudios étnicos americanos. La profesora Cauce obtuvo sus credenciales doctorales en la Universidad de Yale en el área de psicología clínica infantil, y realizó estudios de licenciatura en la Universidad de Miami. Su área de investigación se concentra en estudios con poblaciones adolescentes en riesgo. Ana Mari también dedica sus esfuerzos a impulsar la participación de la mujer en las áreas de ciencia, tecnología, ingeniería y matemáticas. Respecto a su trayectoria profesional dentro de la Universidad, Ana Mari ha ocupado numerosos cargos, entre ellos los de Directora del Departamento de Estudios Étnicos Americanos, Directora del Departamento de Psicología, Decana del Colegio de Artes y Ciencias y, más recientemente, Secretaria General y Vicepresidente Ejecutiva. Entre los galardones a los que se ha hecho merecedora se encuentran el Dalmas Taylor Distinguished Contribution Award, el Premio Luis Fernando Esteban al Servicio Público, el James M. Jones Lifetime Achievement Award de la Asociación Psicológica Americana, el Grace Hopper Exemplary Leadership Award y el Distinguished Contribution Award de la Sociedad de Investigación y Acción Social. En 1999, la Universidad de Washington reconoció su excelencia como docente al otorgarle el Distinguished Teaching Award, el más alto reconocimiento que la Universidad ofrece a profesores por su dedicación al éxito estudiantil dentro y fuera del aula.